No other main line in Britain went from steam to modern traction overnight. 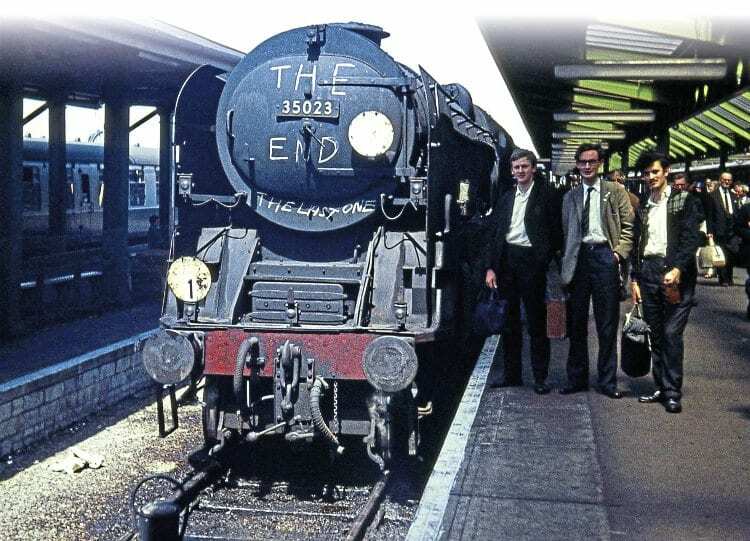 Don Benn recounts the incredible locomotive performances recorded on the Waterloo – Bournemouth line in the days leading up to the sudden end of Southern steam. Of course, some other non-diagrammed workings, such as cover for diesel failures and boat trains to Southampton Docks, were also worked by steam from time to time. Wednesday, June 14 proved to be a good day to be out timing steam. The 6.38pm from Salisbury to Waterloo was hauled by unconverted No. 34102 Lapford and, with 235 tons, this managed just over 60mph on Porton bank, reaching Andover in less than 20 minutes. The driver was Porter, of Basingstoke. At Basingstoke Nine Elms driver John (Boy) Gaffney and fireman Bob Lee took over and I joined the train having gone down on the 6.09pm with VEP electric units. The average speed between mileposts 39 and 35 was 97.33mph and 98.18mph from milepost 38 to 35. Speed variations followed the gradient profile almost exactly. This effort would have required about 1100 EDBH or 2400 IHP. Net time was under 19 minutes, despite the relatively slow start. Stormy Lapford indeed.